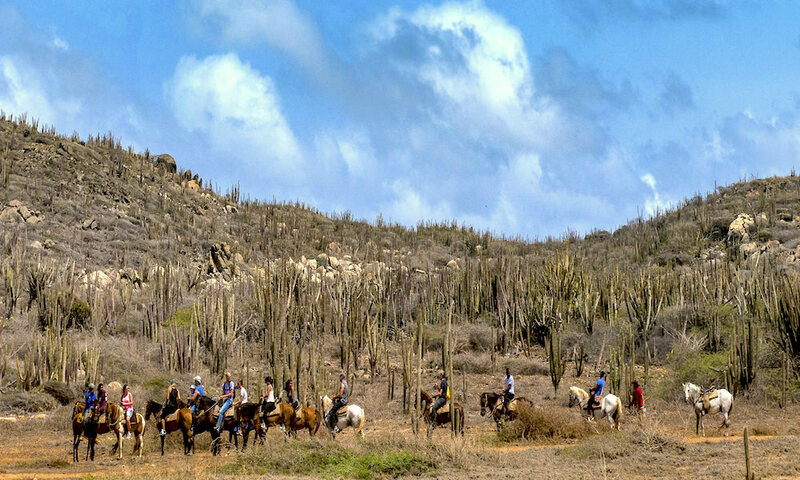 When you are looking for an activity that offers you exploration of the arid plains and some beautiful trails located on the east side of Aruba by traditional transportation, then joining a guided horseback riding tour is a great thing to do. To be “one” with the elements and the horse will give you an unforgettable time to enjoy yourself. Horseback riding brings you relaxation and new energy at the same time. There are many tours you can choose from, either for the novice or for the experienced horseback rider. Some companies have special programs for children. It is important to bear in mind that the companies that offer guided tours handle a maximum weight for horseback riding. Your weight should not exceed 215 – 250 pounds (about 95 – 110 kilograms). In general, horseback riding tours should be taken in the morning or in the afternoon. This all has to do with the temperature at noon which is just too high. In general, group tours are chosen the most. Private tours are also possible for a minimum of two persons. Before you decide to go horseback riding make sure you wear proper clothing, especially long pants. Sunglasses and a hat or cap and sufficient sun block or protective lotion are necessary too to protect you from too much sun. Also bring enough refreshments like water with you. Do not forget to take your camera! You will be offered many beautiful opportunities to take unforgettable pictures! How long does a guided tour take and what are the costs? At Rancho La Ponderosa you will have to pay $80 for a guided two-hour tour. When you prefer to go on a private tour you will be charged $120. At The Gold Mine Ranch, a two hour guided tour costs $75 and a private tour $125. At Rancho Notorious it is possible to take a one, two or three-hour guided tour. Prices vary and they are depending on the tour you take. Private tours are also possible for a minimum of two persons. Rancho Daimari guided tours start as from $65. Private tours are also available here. Where will the guided tours take you? Horseback riding in Aruba generally takes place at the north-eastern part of the island. All the companies have guided or private tours to places like Andicuri Beach, The Natural Pool, Arikok National Park, The California Sand dunes, Daimari Beach, Wariruri Beach and other beautiful secluded places like The Bushiribana Gold Mill Ruins. After two hours of exploring this part of Aruba, you will realize what a great experience it has been! Where can I get further information or book a guided tour? The companies mentioned above all have websites where you can get further information about the packages they are offering, what the rates are and where the tours will bring you. In general, these companies offer free round trip transportation from and to your hotel or resort where you are spending your holidays. Also at the concierge or at the activities desk of your resort or hotel it is possible to get further information about guided horseback riding in Aruba.